Mumbai, March 16 2015: Imagine the excitement and general thrill of holi against typically Thai backdrops, topped with festive Thai cuisine and world-renowned Thai hospitality. Thais, always welcoming, are more than happy to welcome tourists into the nationwide outdoor extravaganza that will have revelers soaked with water from graceful silver bowls (the traditional way of celebrating Songkran), to water-pistols, water-guns, giant hoses and even elephant trunks. You can go about celebrating a second water-festival in Thailand between April 13 and April 15, 2015. Songkran has Indian roots in its appearance and in the origin of its name. The root of the word comes from Sanskrit and means ‘transformation’ or ‘change; to be specific, the transformation of the zodiac signs. The celebration always takes place mid-Summer, when the sun moves into Aries on the astrological chart. Water offers respite from the heat but also has spiritual connotations: it displays respect and is symbolic for imparting blessings. Besides the water-works, festivities involve spiritual customs such building sand pagodas and making merit (doing good to receive blessings). It is also a big ‘spring cleaning’ day and this promotes a sense of community. 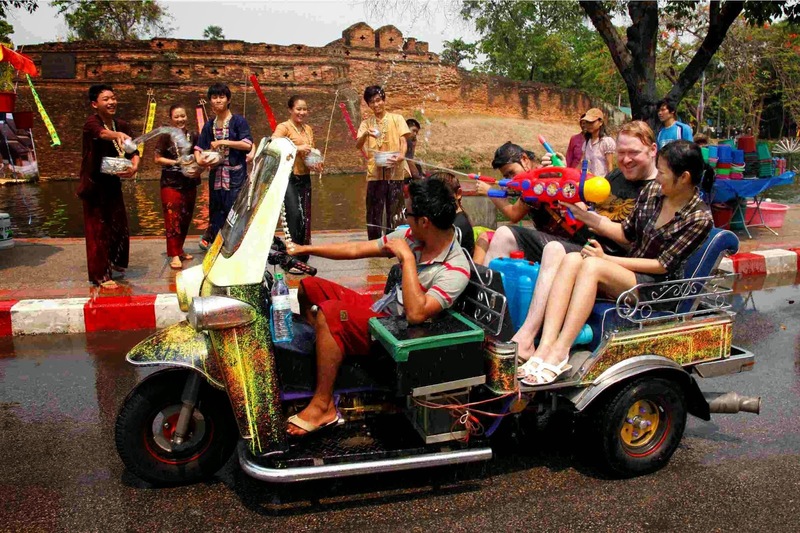 Songkran has marked the start of a new year in Thailand centuries. The idea is to renew and revitalize relationships among families, communities, and within society as a whole. Tourists however, mostly partake in street parties organized on what is known to be Thailand’s biggest holiday. It probably comes as no surprise that Bangkok has the loudest parties; all the beach resort towns rival with Bangkok for ‘most happening’; Chiang Mai’s is rather peaceful and traditional; Ayutthaya’s is very ethereal and Chanthaburi, in eastern Thailand, has a very exciting celebration because of the Kwian Phrabat Tug-of-war Tradition, which has been observed for more than a century. Celebrations often include floats, specially set-up marketplaces and beauty contests besides other little events, indigenous to their locations,that lead up the main celebration. These typically begin a few days before Songkran - this probably emerges from the fact that Songkran commands an almost nation-wide week-long holiday for school children and office-goers alike.